First off, you have to believe the hype. This building really does hold up to all it’s claims and it’s status as one of the 8 wonders of the world. If you appreciate architecture, this has to be top of the list of locations to visit. For me, it meant a long day, but every moment was worth it. I was in line before sunrise so that I had as long as possible to wander around and take photographs. The classic view is the one from the south, where the gleaming white marble structure is flanked by paths and a reflecting pool. Up close, you can see that the marble is decorated in intricate detail. You’d definitely need a macro lens to capture some of the fine carvings. The water features offer the perfect chance to capture the structure’s mirror image in the still pools, a snapshot of life after death. Did Mughal Emperor Shah Jahan consider that this monument, which took around 30 years to complete, would still be drawing in the crowds almost four centuries later? I think he would be pleased that humanity has retained its eye for beauty still. The structure is esthetically satisfying, as it is symmetrically built and decorated. The famous ‘onion dome’ of the central tomb is repeated in the other roof decorations and a minaret at each corner emphasizes that this is a religious site. Other recurring themes in the decoration are the lotus flower and the fact that every high point is topped by a finial, to further accentuate the height. Ornately decorated arches throw deep shadows and the carvings look different throughout the day, as the sunlight strikes them at different angles. There is no human representation here, in line with Islamic laws against the depiction of a deity, but there is an incredible amount of detailed calligraphy, bold dark strokes on a white ground making for great photographs. The colors are often in high contrast, the floor tiles in red and white, the mortar joins stained to contrast with the color of the stone. The light makes for clarity too, although the famous white marble looks beige or sandy colored in the early mornings as the sunrise catches it. The size of the entire structure is something you only appreciate when you’re close to it. This is not just a mausoleum, it is a monument, and in line with such structures, it is large. The detail doesn’t stop outside. The interior décor features inlaid precious stones and bas-relief carvings too, so be prepared to be amazed. 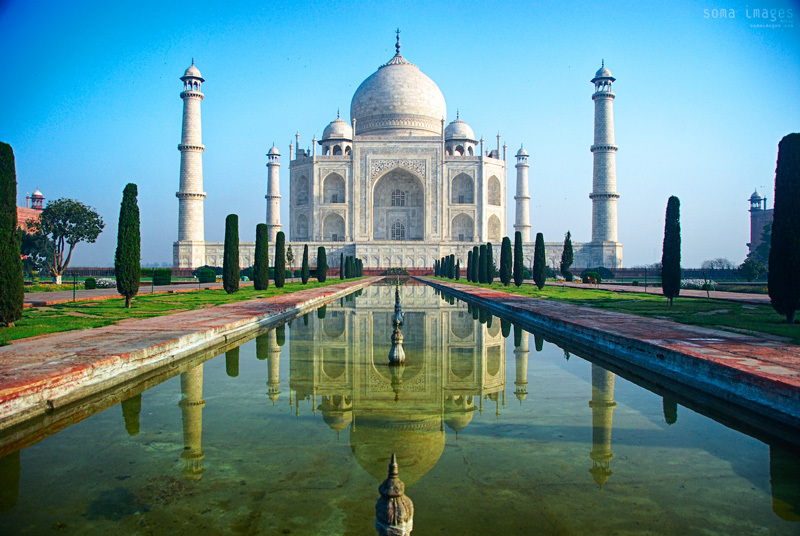 Shah Jahan was obsessed with symmetry and detailed design, and the Taj Mahal is an ideal example of this love of mirror images. Even the mosque has a jawab, or ‘answer’ building. The lasting image is the final one in the series, the view through the Great Gate. A perfect memory, perfectly framed.